For Mounting Beacon Lighting and Finishing Off Top of 45G Tower. The 45G Tower can be used guyed, self-supporting or bracketed configurations according to specifications in the ROHN Tower catalog. As a guyed structure, it can rise to a maximum of 300 feet. Self-supporting and bracketed heights depend on loading and are also specified in the ROHN 45G catalog. Reference the ROHN 45G Tower links in the Footer Section below. 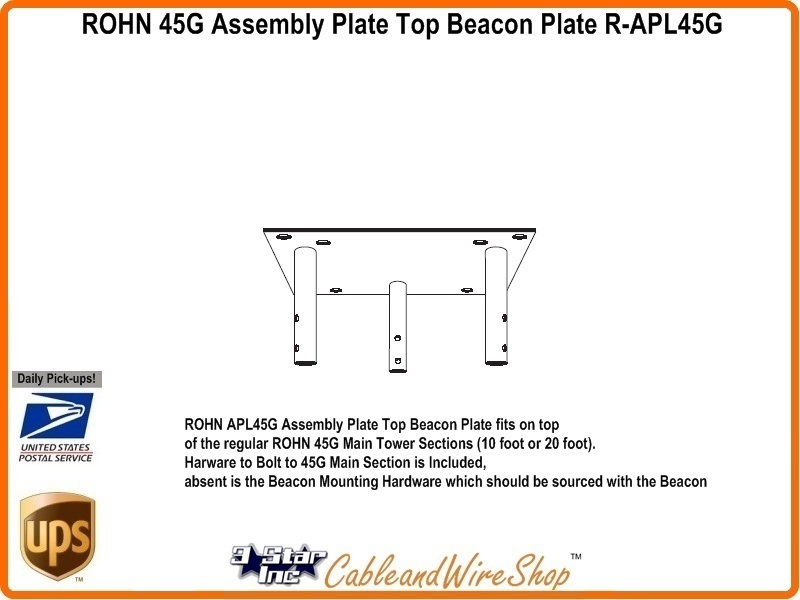 Note: ROHN APL45G Assembly Plate Top Beacon Plate fits on top of the regular ROHN 45G Main Tower Sections (10 foot or 20 foot). Hardware to Bolt to 45G Main Section is Included, absent is the Beacon Mounting Hardware which should be sourced with the Red Beacon. American Steel. Buy ROHN, Buy American.